It appears that Laurelwood Red is now only available in six-packs, so I have removed it from the bomber index (the numbers reflect apples-to-apples with the previous index). I think the replacement bomber will be Base Camp In Tents India Pale Lager, but I want to gather the numbers for one quarter before adding it in, to preserve apples-to-apples comparison with the previous quarter. I also wonder if I will be able to keep Belmont Station in the retail index. They seem to be tweaking the six-pack selection, and I wouldn't be surprised if they dropped some of the old stalwarts that a boring price index depends on. I'm sure the changes allow a more interesting selection there, but it will sadden me to lose that data point (and hopefully I'll be able to find a replacement). The pub side of Belmont is better than ever, and it will continue to be in the pub price index. 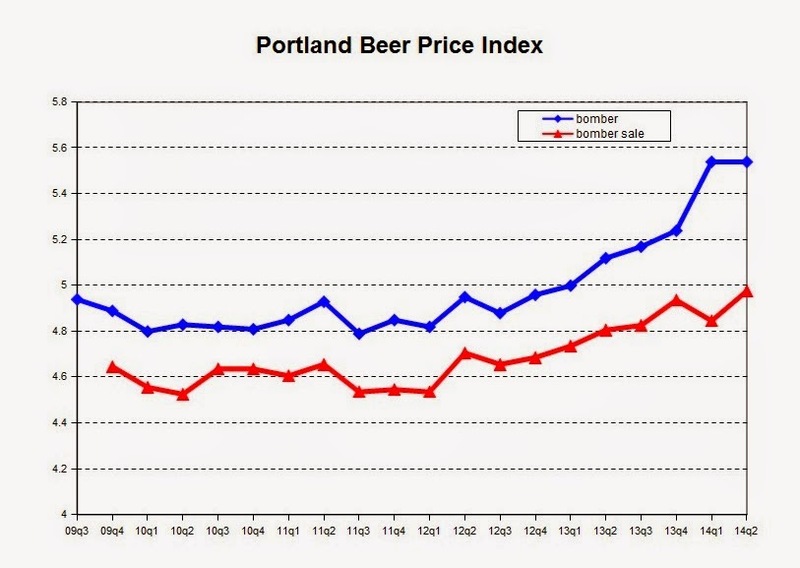 The bomber non-sale price is way up, largely because Hopworks IPA has gone way up in price. Retailers (or wholesalers) seem to be trying to get people used to the new normal by offering discounted sale prices on it for now. The six-pack chart actually tapers off a little bit, mainly because of continued pressure on Terminal Gravity and Caldera, whose six-packs used to be relatively expensive but are starting to fall more in line with everyone else. Check back in three months for the next installment of the index. More information on how the index is compiled is on the PBPI configuration page. I care! You're doing God's work, man, and even if only 14 of us read it, perhaps we'll riff on it and tell the world. I am particularly interested in the declining price of six-packs and the increasing price of bombers. This is a marvelously suggestive find. To Echo Jeff, I care as well. I may be a marginal player in the fermented barley milieu, but I enjoy watching the jostling for position much like those entranced by a ball kicked around a footie field.